Greenland is one of the final frontiers on the planet! It is the most sparsely populated country in the world and there are no roads connecting any of its towns. As a result, travelers must journey around the country either by ship or by flying. The PlanetD explored Greenland on the Sea Spirit ship and enjoyed a 14-day adventure that started from the north of the Arctic circle all the way around to Reykjavik, Iceland. This Greenland travel guide will help you plan your next vacation. Foreigner credit cards are valid at banks and ATMs but travelers are advised to bring some cash as these foreign cards may not be accepted at all shops. Random fact: Greenland is part of the Kingdom of Denmark but is not a member of the European Union. Packing needs largely depend on the time of year travelers will be visiting Greenland and the activities that they have planned. Remember that Arctic climate conditions can change in an instant! Insect Repellent – Along with natural beauty and warm weather, summers in Greenland (specifically July and August) are known for their mosquito swarms. Travels are advised to bring a mosquito net, insect spray or mosquito headnet if planning to hike a mountain, particularly near any glaciers. Layers – The general rule of thumb is to pack at least four layers: a base layer, long sleeve shirts, a fleece (mid-layer) and a top layer such as a windbreaker (waterproof!). Base layers should be make of wool or synthetic fabrics are these fabrics offer superior moisture-wicking and temperature control protection than cotton. Hiking Boots – pack a good pair of boots with good grip that are waterproof and insulated for spring/winter travel. Binoculars – great to have if you plan on going on cruises, and/or hiking, boating or nature tours. 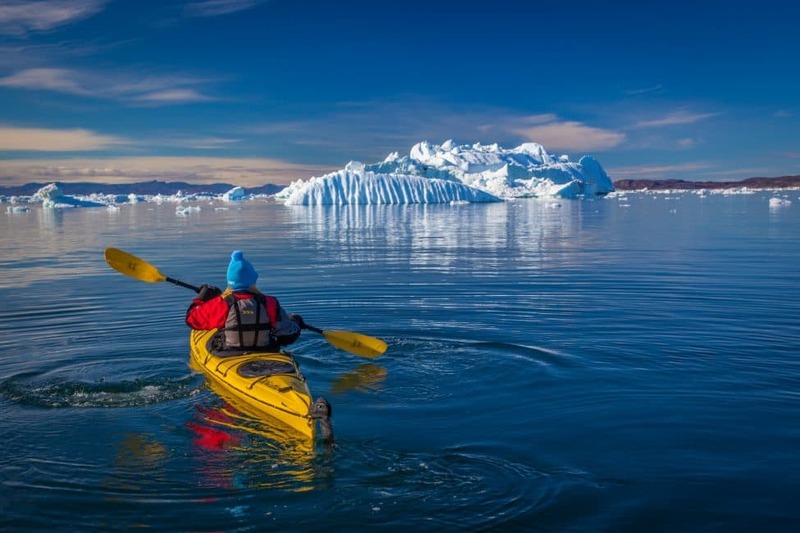 Kayak through Uncharted Fjords – For centuries, Greenland was known as the land of kayakers and today the tradition still holds strong. Take the Arctic Polar Plunge – close your eyes and jump into icy waters. Go on a Greenland expedition – enjoy the sites on board a cruise ship while disembarking for multiple shore landings to explore this magical country. Take a Bath at the Top of the World – drink a glass of champagne while taking a dip in the Uunartoq thermal pool. Meet the locals and learn about the Inuit culture – discover more about Greenland, a unique country where ancient culture meets the modern world. Eat Whale – would you try it?